Habitat : It is a native of europe. 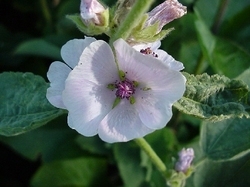 it prefers marshy fields and tidal areas and cultivated in india for medicinal uses. Uses : Marshmallow is demulcent, laxative and stomachic. It protects and soothes the mucous membranes. It is highly useful in dry cough, bronchial asthma, bronchial catarrh and pleurisy. Roots are used to cure excess stomach acid, peptic ulceration, gastritis, colitis and irritable bowel syndrome. Mouthwash prepared from roots is used in inflammations. Infusion of flowers is used to soothe inflamed skin. Roots ointment is used for treating boils and abscesses. Dried root is used as a toothbrush and is chewed by teething children.